This is the weekly update on the AFANA Top 4 Tipping Competition. Each week we will post the results here for the competition. You can follow who is atop the standings. As per last year's Top Four competition you will have 2 chances to change your tips, but that will be whenever YOU decide. You can send in completely new teams, or make some small edits. To do this, just send another e-mail with "Top Four" in the subject header and your teams will be changed. It's that simple. The ladder will reflect how many changes each has made so you can track progress and plan your next change! To sign up and to learn the unique rules for this comp go to: Top 4 Tipping Contest Registration page. 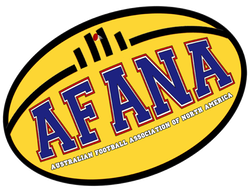 The AFL draw for each round is here: AFL Fixture. The weekly match results are here: AFL Reviews. The 2019 season commenced on 21st March 2019 and the results are published here. Round 2 was also a strange round for tipping so if you missed joining the Comp or passing your Top 4 you can still with little effect - look at the top score!